All glider prices include VAT and postage & packaging to UK. A great all round wing that performs well in serial competitions and hike & fly. Reassuring three liner for XC pilots who want good performance in a fun glider that is safe, simple, and lightweight. Only 238m total line legth, which is close to most two liners. Only micro-lines on the Tala to help reduce knots. BRUCE'S NOTES: In recent years gliders have become very complicated, with more cells, more ribs, and a lot of plastic. The Tala, however, has a very clean leading edge due to its Cord Cut Billow and only 50 cells reducing the weight, line consumption, and complexity of the wing. The Tala is a true three liner from top to bottom. It has three main lines in the span-wise direction and only two levels of lines on the first and second main lines. The third main lines split twice making effective stable big ears easy. The Carrera is a performance wing that offers sporty handling and real-world performance in a highly accessible package. Who is it for? Due to advances in technology, the Carrera has a broad appeal. Experienced thermal/XC pilots—"weekend warriors"—will benefit the most from choosing the Carrera. The Carrera replaces the Tribe (EN C) in our paraglider range. We have been able to increase performance by increasing the aspect ratio of the wing, but without sacrificing handling and stability. It hits the "sweet spot", combining performance, handling and safety in a compact and sporty package. Compared to other wings of similar performance, the Carrera offers an extra safety margin when conditions become challenging, so you never need miss anything the day has to offer. Fully unsheathed lines (except brake lines) Besides the clear performance benefits, unsheathed Aramid lines have the advantage of dimensional stability and give a sportier feel in flight. 3 risers (split A's and split C's) The Carrera riser produces an exceptionally smooth and efficient acceleration. The split A risers also enable easy big ears. Optimized plastic re-inforcements Plastic wing re-inforcements provide a more homogenous and stable feeling in flight. They are beneficial in turbulence, and help re-opening behaviour in rare cases of collapse. Different diameter rods are used at different parts of the sail according to the loading. The original Delta was a revolution in the Sport-Performance class, and incorporated cutting edge design features which launched it into the class above in terms of performance. Not only was its speed and glide revolutionary, it also retained an incredibly compact and agile feel due to its moderate aspect ratio. The Delta could have been difficult to improve upon, but we are pleased to report that the new Delta 2 represents an equally significant, and even more exciting, step forward in paraglider technology. The NOVA TRITON 2 is a breath of fresh air in the serial performance glider class, which follows in the tradition of former DHV 2/3 wings. On the one hand, theTRITON 2 offers impressively good performance and therefore the potential for league, competition and ambitious XC flights; on the other hand, the flying characteristics of the wing are completely manageable for an experienced pilot. So it is exactly what discerning pilots want: the ultimate flying machine, which combines performance with certification-appropriate safety. Thanks to the selected moderate aspect ratio (6.4 flat) the TRITON 2 offers the whole range of flying characteristics: the wing is agile, brake pressure is low and it invites you to play above the landing field after completing a satisfying XC flight. The TRITON 2 therefore offers everything a keen cross-country pilot wants: excellent performance, good certification-appropriate passive safety, a wing that is greedy for the best lift in thermals, very sensitive brakes and a glider that offers an exceptionally high fun factor. Technologically ahead. 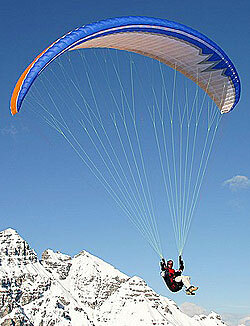 The Triton 2 is the result of NOVA’s 25 years experience in designing paragliders. Its flying behaviour was predicted using analytical tools and airflow simulations. Inside the wing, innovative needle-eye ribs distribute the tension across the span of up to five cells at a time. The needle-eye ribs are each made out of one piece of material and traverse through slots in the profile ribs. This results in a more precise shape than is achieved in a conventional four or five piece rib, which is implemented using multiple-piece diagonal ribs. 3D-Shaping and optimised position and size of the cell openings enhance the performance potential of the Triton 2. Genuine performance. No folding line. No cross-line. No other tricks were used. The Triton 2 is a performance three-liner suited to a skilled and experienced pilot. And they will get what they expect: a wing with exceptional performance which has been fully tested in all possible collapse scenarios. The leading edge of the Triton 2 is reinforced with extremely flexible rods, but these are short and end just after the A area. In comparison to the Triton 1, the A area was not set back. For this reason, collapses are generally less extensive – we found this both during induced asymmetric collapses using the A-riser, as well as in spontaneous collapses in turbulent air. With a moderate aspect ratio of 6.4 (flat) the Triton 2 continues the tradition of its predecessors, the Tycoon and Triton 1. Innovative and progressive. With its aspect ratio, wing area and its passive safety features, the Triton 2 is a traditional glider, but simultaneously it comes with a bundle of innovations. One of these is the mix of materials: to improve its extreme flight behaviour, we used a very light but durable material (32 g/m2), which also features in the Mentor 3 light. The leading edge is fitted with an improved Nova air scoop which increases the internal wing pressure – especially in accelerated flight. The Triton 2 therefore profits from the know-how that we gained from developing the Ion and Mentor series. The TRITON 2 is a high performance wing for an experienced and current pilot. The wing distinguishes itself by impressive performance combined with (for its class) very manageable extreme flight behaviour. The Rolex of paragliding - This is the most secure DHV 1 yet with respectable performance. Beginners, during and after training. The regular pilot who makes progress and wants a glider with modern performance but easy to handle; for example the pilot of an ALPHA 2 who wants to move up in the range. The pilot who flies occasionally (less than 30 flights a year), even if he is an experienced pilot (he will have real fun and will feel safe). Advance Alpha Extra Large: Total price inc p+p = £1900.00 Add to basket. The EPSILON series, from the "1" that arrived in 93 until today with the arrival of the "4", has surely marked the world of paragliding. It is the most popular glider in the ADVANCE range and probably one of the most distributed in the world : more than 7000 gliders, of which 3000 were EPSILON 3. It is a new ADVANCE, with a brilliant and high level of passive security ; it will allow the occasional as well as the regular pilots to discover a playful and essential dimension of flying : ease of use, pleasure and security. It is the 21st glider marketed by ADVANCE.